The best villains aren't the malevolently evil characters, twirling their moustaches as they tie women to the traintracks. Rather, for real drama, you want a villain who thinks he's the good guy of his own story. Dr. Doom wants to make life as good as possible for the citizens of his homeland. Lex Luthor wants to protect humanity from alien influence. Classic bad guys, but in their mind they're the heroes. Brad Bird recognized this when he made his newest film, The Incredibles - the villainous Syndrome was a fan of superheroes all his life, and wants the public to recognize how much they're needed, recognize that not everyone is special and honor those who are. That's why he does what he does. While the mass-market Incredibles figures are pretty disappointing, customers shopping at the Disney Store could get a better set of figures with a larger scale, more articulation and less obtrusive action features. The sculpts are great, the paint's perfect... why weren't these in real stores? 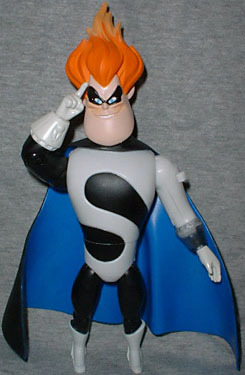 Syndrome's costume looks like it was designed by Alex Ross in his "one giant logo" phase - from neck to groin, the costume is one big S. The white and black make for a great visual contrast, and the blue of his cape adds some spark. The paint apps are all handled perfectly, with no overspray. Whether a real sculptor handled the design or it was taken directly from the digital data, Syndrome looks the same in plastic as he does on film, right down to the jets on the soles of his tiny little boots. His design is very rounded and fluid, just like his S logo. 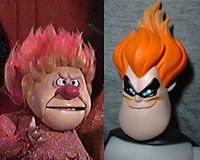 His head, actually, seems to have been inspired by the old Rankin-Bass Heat Miser - just one of the many retro pop culture cues lovingly hidden in the film. 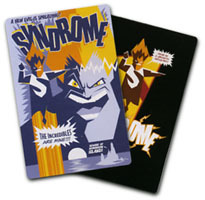 Syndrome is 6" tall at the tip of his wild hair, and moves at the neck, shoulders, right bicep and elbow, wrists, waist, hips and knees. The left arm doesn't have as much articulation because it houses a battery compartment and a light - press the small button on Syndrome's shoulder, and his control wristamajig lights up. The figure doesn't have any accessories, but he is packaged with a translucent orange Incredibles logo ring and two cards. The packaging is an oddly shaped clamshell, clear in front and bright red in the back, with a big version of the I-logo behind the tray. It's a shame that these figures are only available at the Disney Store - they're well made and really fun, just the sort of figure this film deserved. What's up with those goofyass Alex Ross costume designs? Tell us on our message board, the Loafing Lounge.